This is one of our very favourite fairy light ceiling installations! 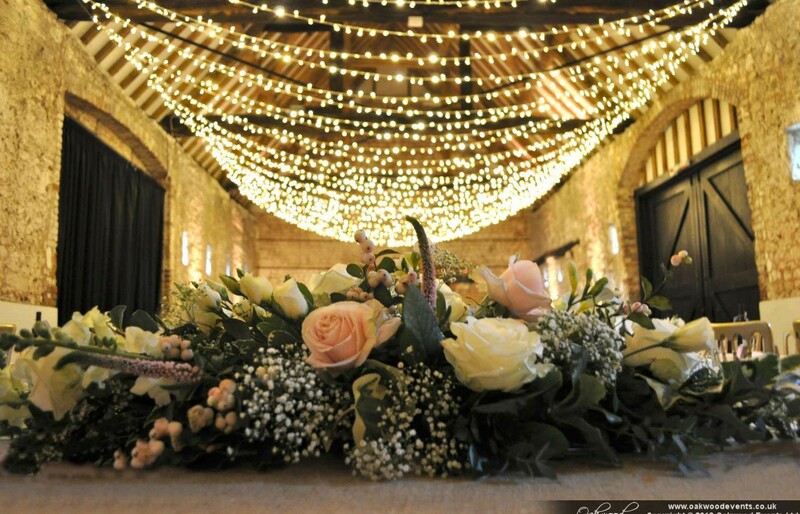 The couple had a specific look in mind for lighting their wedding at the Monks Barn in Hurley, based on a photo found online. However the layout of the beams in the barn didn’t immediately lend itself to the design so we worked together to design a practical solution in the same spirit as the photo, adapting it to work in a different barn. Despite being located in several different countries in the lead-up to the wedding, the bride, groom and parents kept in touch with us via email and between us we settled on the design shown here. The installation on the day ran like clockwork and we think the results speak for themselves! Our thanks go to the couple and their families for trusting us to realise their vision. A massive thank you for making our day so completely perfect. 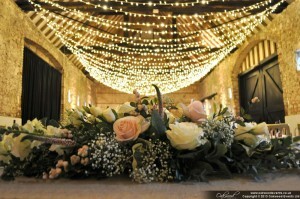 You went above and beyond our expectations especially with the fairy light canopy that everyone is still talking about!